Externat des Glacis is a small private school for children from 2 (starting at garderie) to 12 years old. 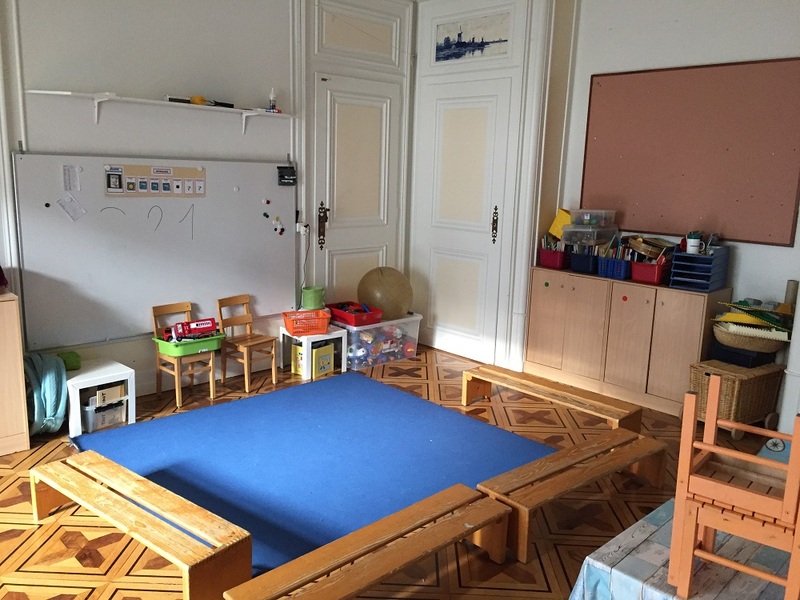 The school is very keen on maintaining its close-knit family atmosphere and gives preference to the local families who intend to stay in Geneva and whose children are likely to complete all of their primary education at Externat des Glacis. In fact, it is not possible to sign up children only for two pre-school classes – garderie and jardin d’enfants. Children who start at garderie will automatically continue to the 1st form of the school. The main reason for this is to ensure that students can make long lasting friendships. Externat des Glacis was founded in 1927 by the Rossiaud family. It was originally located on rue des Glacis de Rive, which later gave its name to the school. In 1980 Externat des Glacis became a charitable organisation governed by the board which delegates matters of education and pedagogy to the director. Throughout its history Externat des Glacis had only three directors, the latest, M. Alexandre Odier has been heading the school since 2002. Despite being a catholic school, Externat des Glacis advocates religious openness and embraces all Christian religions. Such religious orientation manifests in promoting values like tolerance, respect of others and self-respect as well as moral and intellectual rigour. Externat des Glacis’ curriculum is based on the national study plan of the French speaking Switzerland and complemented by elements of national curriculum of France, so that at the end of their primary education students could continue both in Swiss public or private system, and in the French system. The basic subjects are complemented by the languages: English from year 1, German from year 5 and Latin taught in the last form of the primaire by the director himself. Music and gymnastics are included into curriculum from year 1, while informatics, religious studies, philosophy and manual work from year 3. Religious studies remain non-obligatory during years 3 to 6 while they concentrate on the Bible and Christianity. In years 7 and 8 students compare the main world religions and visit the mosque, the synagogue, the Russian church and St Pierre Cathedral. At Externat des Glacis students also celebrate Christmas at St-Joseph church, Easter at school and attend the end of the year mass at the church of St Marie-Medeleine. Externat des Glacis participates in the inter-school competitions in handball and table tennis. Students also participate in Prim-ski and Prim-cross – competitions among the pupils of Geneva organised by the city. Every other year students from Externat des Glacis go a ski camp. In the alternative years the school organises a week long trip to London. The school day generally lasts from 9 am (8 20 from year 4) till 15 40 with the two hour break for lunch. Wednesday is a short day when all classes finish at 11 30. After school hours children can remain in the evening garderie until 17 30. Older students can be signed up to the supervised homework programme. The garderie for children from 2 to 3 years old welcomes children from 13 30 till 16, while jardin d’enfants for 3 to 4 year olds operates in the same classroom in the morning from 9 till 11 30. To register with Externat des Glacis parents need to contact the director, Alexandre Odier directly by phone (+41 (0) 22 346 38 19) or by email (alexandre.odier@externat-glacis.ch) to set up a meeting. It is not possible to sign up a child without such preliminary interview with the director. Every child is initially put on the waiting list until March of the proposed year of entry when the school knows the number of places it can offer to new children. Once a child has been offered a place at Externat des Glacis, the parents are invited to pay the registration fee and the deposit, which will be deducted against the first tuition bill. Children entering the garderie (for 2-3 year olds) or jardin d’enfants (3-4 year olds) are not required to take any tests. Older children applying from year one upwards need to pass a teacher evaluation or sit a test in mathematics and French. However, the final decision regarding admission of a child is made by the director.